The Act of Aggression preorder trailer released yesterday may not be quite as informative as the faction videos we've been treated to previously, but it does carry with it one very important bit of information: a proper launch date. Act of Aggression will go live on Steam on September 2, a date that's not actually revealed in the trailer, but in the YouTube description. 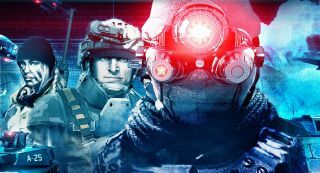 Publisher Focus Home Interactive also announced that prepurchases may now be made at a 15 percent off the regular price of $45/£35, and that gamers who lay down their money ahead of time will also be granted access to the multiplayer beta. The beta is expected to begin in mid-July, and will be updated with new content throughout the summer. Act of Aggression was announced last year as an old-school RTS follow-up to developer Eugen Systems' Act of War and Wargame RTS franchises. It will feature resource collection, base building, and three unique, rock-paper-scissors-style factions fighting for dominance in the near future: The tough, lumbering US Army, the versatile, high-tech UNO task force Chimera, and the Cartel, "a shadowy organization gathering together political men, arms magnates, [and] military decision-makers," who secretly wield the power of numerous private military companies. The Cartel doesn't have its own swanky trailer yet, but more information about them can be had at eugensystems.com.